Here are some ways of how to plan family fun for spring break! Sit down with the family, kids included, to have a little discussion about what each family member would enjoy doing during Spring Break. Make a list of ideas and take into consideration the budget so that you don’t overspend during this week off from school. Encourage family members to come up with family fun ideas for Spring Break that allow you to stay close to home. Once you have hosted your family meeting and created a list of family fun for Spring Break ideas, take a moment to reduce to the list to a handful of reasonable options. Now that the adults have made a minimal list of ideas that are options for Spring break, have the kids vote on their favorites. You can take the vote verbally or make it a fun process with little ballets that each family member puts into a basket. Then review all votes and count which family fun ideas have the most votes. Now that you’ve figured out, as a family, what you want to do for family fun during Spring Break, you can easily make a plan. Take time to consider what costs are involved, make a note and confirm this is something you can afford. Then figure out what days will work best for each of your family fun ideas and just run with it. You can even go so far as to create a family fun Spring Break itinerary to make the family feel all fancy in preparation for the week off from school. Even if you’re not planning to travel for Spring Break, there are many family fun ideas that you can incorporate into that week off from school that will still encourage family bonding time. 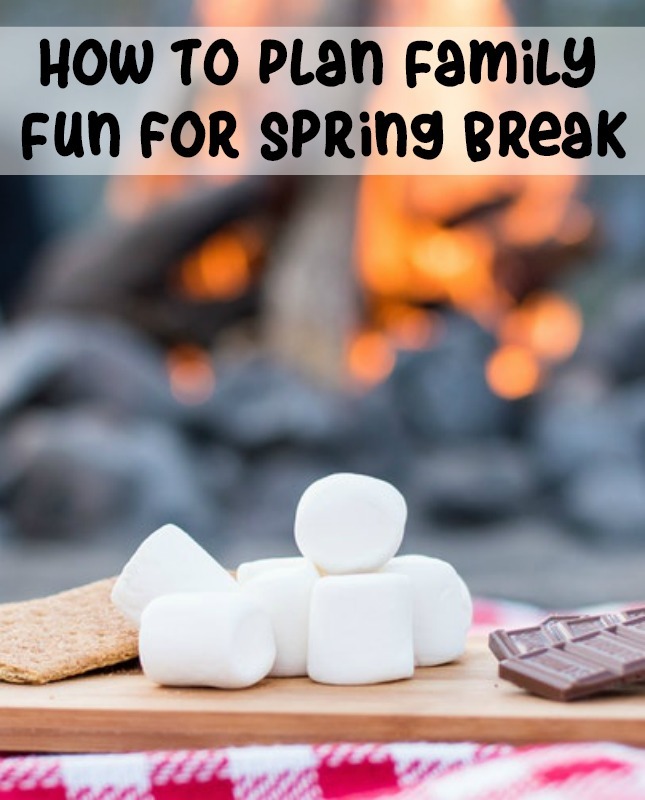 These tips on how to plan family fun for Spring Break can be tweaked into something that works best for your household, but overall this is a great starting point to get planning that Spring Break fun! I love the idea of taking a vote. We always as our kids what they’d like to do over spring break when we’re planning for it. Sometimes we take a trip, sometimes we just stay home and relax. You are so good to get something planned for spring break. I have not been able to find the time so my kids do not have anything to do and we are not going away. I know I will be sorry when that week comes and the kids are asking what to do. I like the ideas of hosting a family meeting and taking a vote. Getting the kids involved in family activities is a great way to have fun together! Those are really awesome ideas for Spring break. We don’t usually travel, we do what we can at home so it’s nice to come up with things to do for the week. I think a family meeting is definitely a must so you can talk about what everyone wants to do to have fun. I wonder how well votes will go over with my family! I think it’s a good way to teach fairness and to figure out plans that will make everyone happy for Spring break. We have done staycation vacations and have gone away during Spring break. It’s great to plan for it either way, and every family should do what works for them. These are really great points! Love the idea of letting kids vote for their favorite activity! It would be nice to plan something with the family for spring break. It doesn’t have to be a grand vacation, just something that we can do as a family even when we’re at home. This is a great way to come up with that! My grandkids are on spring break and there is still tons of snow on the ground. So of course they went sledding the very first day after sleeping in. It is Spring Break for us, and we’re not doing much. I won’t entertain my kids since they are older. I am taking my daughter to Six Flags tomorrow, but that’s about it. I love the idea of making this a family decision! After all it is all about the fam! Great tips! I like the idea of a family vote. It gets the kids involved in their own Spring Break adventures. What a fun idea by getting the whole family involved and taking a vote! My kids would LOVE that!! Great ideas. I’ve never had to plan spring break for more then one child because mine are far apart, but I can only image how it is. We are planning our Spring Break as we speak. We will be staying local but want to do lots of fun things so we aren’t bummed that we aren’t hopping on a plane! No Spring Break plans here but I did this growing up! We always took a vote or did a majority rules, or sometimes went with the second option from the previous year. You really know how to make the breaks a good time! I am so looking forward to this break. It’s nice to plan activities for the family this Spring break and having a meeting and talking about what you guys have in mind is a great way to come up with a plan you’ll love. It doesn’t have to be far away, you can be a tourist in your own city! Spring break really calls for a bonding moments especially for families who have kids. I agree to the idea of having a family voting options too. Lol. If there will always be a voting for travel, I guess we will have to travel every now and then. My family loves travelling anytime of the year. I think including the children would increase the anticipation and excitement for them! I would like to have options for mine as they are still on the younger side, but definitely something we can meet as a family about! We don’t really get a Spring break here since my kids go to private school. We do however have an Easter break which is nice. This is something really worth considering for me from now. Our vacations and activities in my home have never been this democratic lol. It has been all dependant on my affordability but now that the girls are becoming their own person I will be bringing them in what to do during vacations. These are good tips for a fun, successful spring break. We will be going away for several days. We can’t wait! These are all great plans for Spring Break! I never did much on the break as a kid and I don’t get them as an adult…booo!! I’m so looking forward to Spring Break! We have so many fun things planned for the kids.